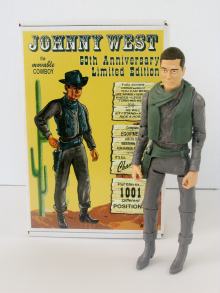 It’s also worth noting that the Johnny West line was not simply a boy’s toy. Girls loved the inclusion of Jane West and the girls, all of whom were equipped with firearms in additon to skirts and make up. Plus girls loved the horses. 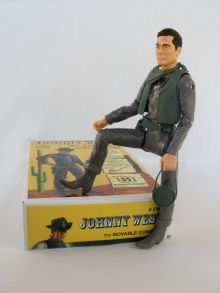 Johnny West was a toy line that boys and girls played with together. In the early 1970s Louis Marx sold his company to Quaker Oats, and they managed to take the most successful toymaker in the world and turn it–in less than five years–into an also-ran company that was struggling to make a profit. The company ceased to exist in 1981 when the last manufacturing plant in the US, in Glen Dale, WV, no less, was closed. However, with millions of toys sold, billions of memories of those toys had been made. Collectors kept the name alive. Then talented customizers like the late Noah Coop and his wife, Terri breathed new life into the hobby with custom heads and newly-produced bodies from their CXR brand. Terri also secured many of the key trademarks to Johnny West and related names. On top of that, the molds for many of these figures still existed. Mexico, in particular has a wealth of still-working molds for the classic figures, and they still make some for sale. “Oh My Lord. I’m My Own Grandpa!” New Johnny meets Vintage Johnny. And that brings us to the figure I’ll be reviewing in this post. Over on Facebook a very active Marx Action Figure Collectors group has been busily keeping the hobby alive. Earlier this year the Western stars aligned, and a 50th Anniversary Limited Edition Johnny West was born. James Wozniak has been importing reproduction Marx Toys from Mexico for a while with his company, Classic Recasts. Jean Zabre and his family run the plant in Mexico that owns the molds formerly used by PlastiMarx, Marx’s Mexican subsidiary. Terri Coop owns the legal rights to the name “Johnny West.” Scott Stewart runs the Stewart’s Attic website and was helping bring all the parties together behind the scenes. I was cheerleading publicly, along with most of the rest of the Facebook group. 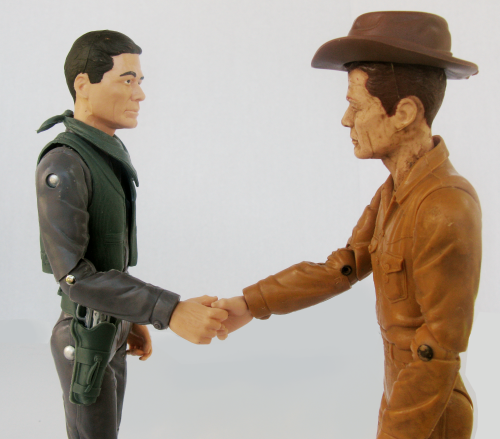 The plan was hatched for an official 50th Anniversary Johnny West figure, produced in new colors so that it wouldn’t be mistaken for a vintage Johnny. His body would be dark gray, rather than the classic caramel brown (which crumbles over time due to some instability in the dye). His soft vinyl accessories would be a dark teal. The hard plastic accessories cast in a pewter/silver color. His package art was designed by Scott Stewart, based on the original Johnny West box, but showing off the new color scheme. A certificate of authenticity, signed by Terri Coop and James Wozniak, and designed by Mark and Lori Keach, is included. Each certificate and box is numbered 1 to 200. Over a hundred figures were pre-sold, and James, being a one-man show, had to assemble each set himself. That’s one reason I waited more than a week to write this review. I know that James has more sets for sale, but I also know he was snowed-under putting the pre-sold sets together, and I wanted to give him a chance to catch his breath. I believe that he’s asking $75 for these figures, plus shipping, but you’ll want to contact him through his website for complete details. Links are at the bottom of the post. You’ll find some other goodies there that you might want, so he may cut you a deal on shipping. You should have already figured out that this is going to be a positive review. This is a fantastic recreation of the Marx action figure experience. I only have one minor criticism of this set, so I’ll get it out of the way first. It’s actually flattening out since I wrote this. 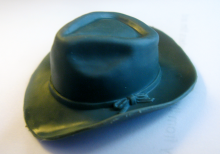 His hat didn’t seem to come out of the mold in perfect shape. I think I can reshape mine with a little heat, but some folks are reporting that their hats are trimmed a little off-center. Considering that we’re talking about toys made with fifty-year-old molds, that this is the only imperfection is astounding. Everything else about this set is a Johnny West collector’s dream come true. The body looks terrific in dark gray. It’s different enough to make it “new,” but it still has the heft, the feel and even the smell of the original action figures when first opened. The joints are tight and there are no flaws in the virgin vinyl used to make these figures and accessories. Three faces of Johnny. Left to right: 1999 reissue Johnny, 50th Anniversary Johnny, crusty vintage Johnny I got cheap off eBay. He hasn’t been cleaned up yet. Johnny’s head sports a dark brown hair color, rather than the reddish-brown of the original. The whites of his eyes are painted, which was not done on the US figures back in the day. The darker hair and greater detail make this Johnny West look younger, and slimmer in the face than his vintage counterpart. It’s nice to still look young when you hit 50. Both the hard and soft accessories are shipped still connected to the sprues (or “trees” or “runners,” if you want to be technical). A few larger pieces may come loose in transit, but it’s still cool to see them sent out this way. Except for the shape of the hat, the soft accessories are perfect. It’s remarkable how well the molds, which are half a century old, have retained the fine detail like the texture of Johnny West’s vest, or the bullets on the back of his gunbelt. 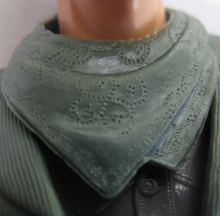 You can even make out the pattern on his bandana. As a bonus, two extra soft vinyl accessories are included. Molded in yellow, General Custers’ neckerchief and gloves make a nice color contrast, if you are so inclined. There is a difference in the feel of the soft vinyl accessories, and I like it. These accessories–the vest, bandana, gunbelt, spur straps, canteen, chaps and gold bags–do not have the slick, oily, gloss that the originals and some earlier reissues have had. 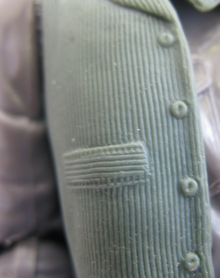 It makes them seem more pliable, and shows off the detailed textures better. It also looks more natural and may mean that the plastic is more stable and might not melt if left in contact with other plastics. I have seen some comments about the chaps being more fragile, but I’ve always had problems with those and take great care putting them together. The texture on the Derringer grip is amazing. The whole gun is about half an inch long. 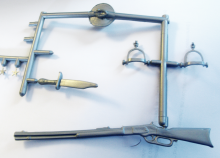 The hard accessories include a revolver, a rifle, Derringer, spurs, two different branding irons, coffeepot, skillet, strongbox, knife, and two sheriff stars. Again, the amount of detail and texture is amazing. 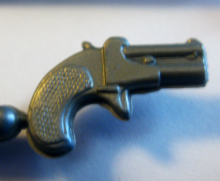 The pistol grip on the tiny Derringer is still there, as are the rivets on the strongbox. The rifle sports ornate carving. The plastic is hard enough to remain rigid (a problem with some previous reissues) and the color is distinct enough to keep these from being mistaken for vintage pieces. This set is a home-run, make no mistake about it. 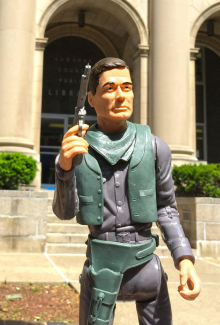 After last year’s fiasco of Hasbro failing to properly pay tribute to their original GI Joe, it’s wonderful to see a real grassroots effort among fans come to fruition with such a cool new toy. 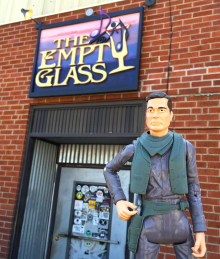 This is the action figure analog to the Charlton Neo comic book movement–a project undertaken for the pure affection for an artifact of a bygone era. The thing is, like Charlton Neo, this little burst of nostalgic glee may well morph into an ongoing full-blown revival. James, Jean, Scott, Terri and Mark have all ganged up again for a very special re-issue of Johnny’s nemesis, Sam Cobra, molded in an all-new body color, with all of his hard-to-find accessories. I’ll tell you more about that project once it’s close to completion. There is yet another cool 50th Anniversary celebration of Johnny West. 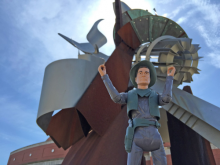 Ten years ago Las Vegas artist Suzanne Hackett-Morgan curated a special “Travelin’ Johnny” exhibit, which is still on display at the Marx Toy Museum. 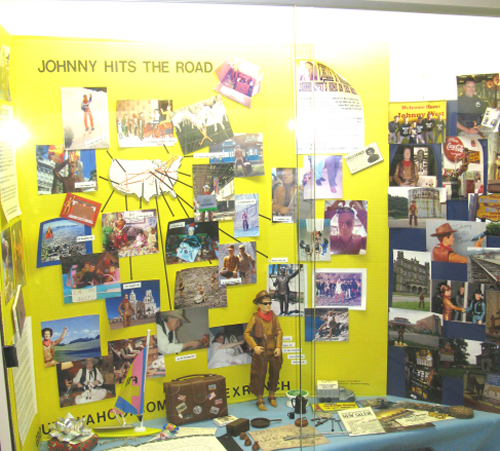 That display tracks the movements of a vintage Johnny West on his travels all around the world. He’d visit collectors in different cities via Pony Express (or it’s modern equivilent) and they’d take photos of Johnny with local landmarks. This year Suzanne is collecting photos for a slide-show presentation that revisits the concept, only instead of sending one vintage Johnny West figure around, people are taking photos of their 50th Anniversary Johnny’s and sending the photos to Suzanne. Last week I enlisted the aid of my buddy, Mark Wolfe, to show Johnny West around Charleston. All the cool location photos accompanying this post were taken by Mark as we ran around town, jumping out of the car for photos, then jumping back in. It was a load of fun. And fun is the key word here. Johnny West was fun when we were kids, and he’s still fun. 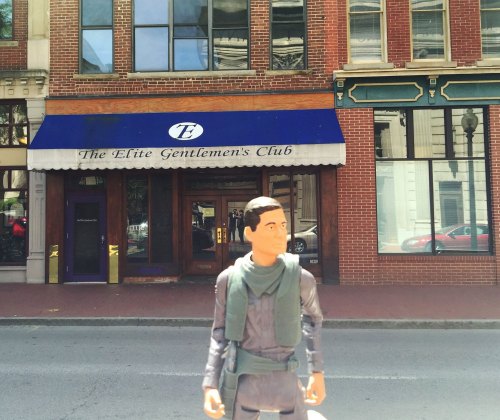 There’s something cool about two guys our age running around town with an action figure, and having it wind up as a museum exhibit. You can see Suzanne’s 50th Anniversary slide show next month at the annual Marx Toy Convention at Kruger Street Toy and Train Museum. The show runs June 19 and 20 in Wheeling. You can find full details HERE. There will also be related events that weekend at the Marx Toy Museum, just down the road in Moundsville. Find out more about it HERE. 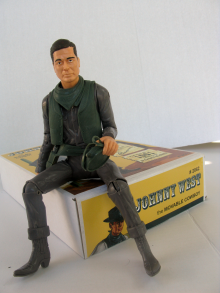 For my photo essay of Johnny West at the Marx Toy Museum, visit HERE. If you would like to order this new 50th Anniversary Johnny West Limited Edition signed and numbered set, contact James Wozniak at the email address you’ll find HERE. If you’re a die-hard Marx collector, check out his eBay store and poke around his website. Scott Stewart will also have some of these Johnny’s for sale at his website alongside vintage Marx and other cool 12″ action figure gear, and he also has an invaluable online guide to collecting Marx action figures. 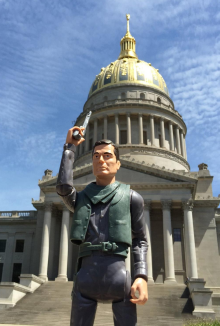 For a detailed video review of the 50th Anniversary Johnny West figure, check out this video by Jase Marshall of Marshall Made Collectibles. And if you want to join the Marx Action Figure Collectors Facebook Group, go HERE. You can expect to read much more about the Marx Toy Convention and upcoming 50 Anniversary Johnny West figures here in PopCult in the coming weeks. Love the 50th anniversary Johnny West. Have not had a chance to pick one up yet, but plan to do so soon.